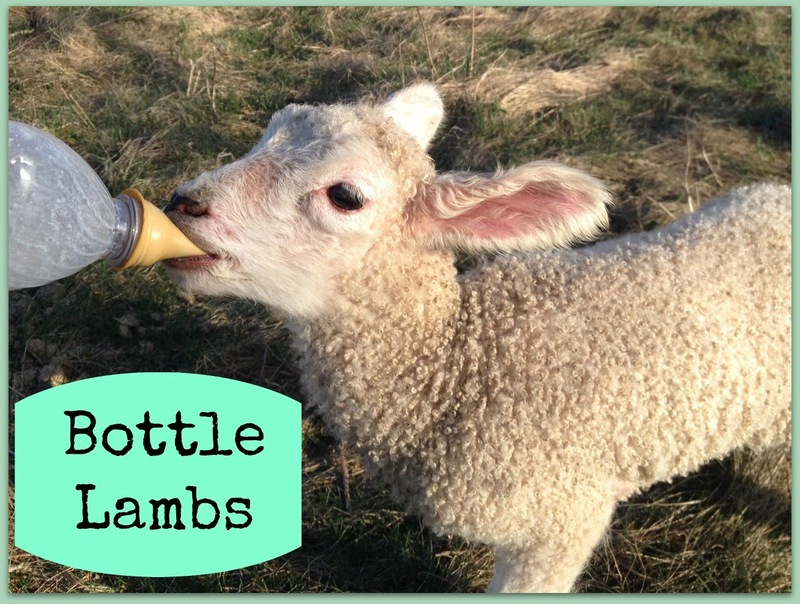 There are several reasons you may end up with a bottle lamb. We do what we can to remedy this. I will put the ewe and her babies in a a pen. If the mother pushes the lambs away or refuses to let them nurse, I will put a halter on the ewe and tie her up so she cannot move her head and I will let the lambs nurse. If the ewe is not aggressive towards the lambs, I will keep the lambs with her in the pen. I will go out every couple of hours and make sure the lambs are eating. Even if it means that I have to continue tying her up each time. The lambs need the colostrum that they get from their mothers the first few days. Usually the ewe will come around. If the ewe is aggressive with the lambs (hurts them) I will keep them in a separate pen next to hers. If this doesn't work then we have a bottle baby on our hands. We have never had this happen, but on occasion the ewe dies after she lambs. You can try to graft the lamb onto another ewe who gives birth to a single or loses her lamb/lambs. If that is not possible you are left with bottle feeding. This is the situation we are in this year. We had a hard winter and have a few older ladies that can't provide enough milk for their lambs. We decided to keep the lambs with the ewes and supplement bottles. I like to keep the lambs with their mothers if we can. They are more socialized that way and act like sheep. When we are their "sole mothers" they do not behave like sheep. Life is much easier for them when they are raised with the flock. We have only had triplets a couple of times in all the years we have raised sheep. But some breeds are known for having triplets/quads, and sometimes the ewe cannot take care of them all. You have to make a choice and bottle feed one of the lambs OR supplement them all. Lambs do well on goats milk. When we have an adequate amount of milk on hand that is what we use. This year we do not have enough to go around so we are using Lamb Milk Replacer. It is expensive and not my first choice. I have also mixed goat's milk with the Lamb Milk Replacer. I had a bag of milk replacer on hand in the freezer but upon further inspection I realized it was NOT for sheep. Too much copper content. Make sure you check labels when purchasing replacer from the farm store. They are not all created equally. Different species of livestock have different needs. Thankfully, the bummer lambs we have this year took to the bottles right away. I was surprised since they were actively nursing. Bottle feeding doesn't always go smoothly. Some lambs are quite stubborn and take quite a bit of coaxing to accept the bottle. We follow the feeding guidelines given on the bag of milk replacer. We just went to three a day feedings from four! We will eventually get down to 2. It is time consuming having to feed the lambs. It is never the ideal thing , even if they are CUTE! They stopped to watch the lambs, I think they must have felt pretty special having such a fan club. I have a twin I am supplementing. There is something humbling about being greeted by a hungry animal(s) that makes me smile. May your bottle babies be grateful for all you do and you don't smell like milk replacer all day. Sandra, I loved the mental picture of the lambs chasing the jogger and the child on a bicycle. How funny! You can get very attached to bottle babies, they are so sweet! I'm a "city" girl (well, more of a suburbs girl) and don't know a flip about sheep but this post really caught my interest. I'm excited to read more of your posts and imagine myself as a homesteading shepherdess, too. Love them chasing the "peoples" :-). Good post! Thankfully we sold all of the babies, but two, I get attached! What a sweet post you wrote!!! The bottle lamb is so cute!!! Keep doing such a great job with them:) Thanks for sharing.